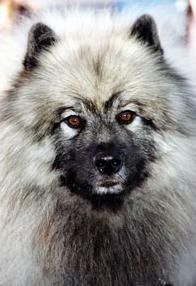 The origin of the Keeshond is the Netherlands. The Keeshond (pronounced caze-hawnd) is best known as the Dutch Barge Dog, having come to prominence guarding the barges traveling up and down the canals of Holland. It took its name from Cornelis de Gyselaar, the leader of the Patriots in the Netherlands during the late 1700s, whose dog "Kees" became the political emblem of the Dutch party. Keeshonds live from between 10 to 16 years of age. Keeshonds are loving, gentle and loyal dogs. They can occasionally be stubborn, but they learn quickly and make an outstanding family companion and watchdog suitable for both children and adults. As a breed, they are extremely adaptable, and instinctively clean in their personal habits. Keeshonds get on exceptionally well with other dogs. 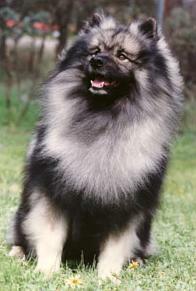 Keeshonds have a dense, harsh, odourless coat that consists of two layers – a soft thick undercoat through which grows the longer, harsher guard hair. Both coats inhibit dirt from penetrating to the skin and so bathing is rarely needed. In hot and humid weather when most Keeshonds loll in their personal dirt dugouts, or when they are shedding, a bit of extra care and possibly a bath may be in order. Check the dog's toenails and claws regularly and carefully trim the hair on the bottom of the feet so they are flush with the pads. Keeshonds can be very noisy if left alone for long periods outside, as they believe they are part of the family and want to be with you. Ideal owners range from children to adults.